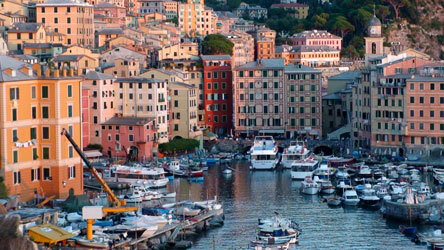 Sunny, unabashedly Mediterranean, the cooking of Liguria makes the most of the fruits of land and sea. Its luxuriant hills offer a bounty of meaty porcini mushrooms and resiny pine nuts, while the sea provides succulent anchovies ready to be salted for future use. These three ingredients are combined with other staples, most notably the region's delicate olive oil, to create Liguria's favorite dishes: braised salt cod, stewed rabbit, and an array of subtle pasta sauces. Focaccia, a dimpled flatbread, is the region's most emblematic bread, usually baked plain but sometimes stuffed or topped with every ingredient imaginable. You can make the gnocchi up to 12 hours ahead, spread them out in a single layer on a floured tray, cover them with a towel, and refrigerate them until needed. Alternately, you can place the tray of gnocchi directly in the freezer and freeze the gnocchi until they are solid, then store them in freezer-safe bags for up to 1 month; do not defrost frozen gnocchi before boiling. Make the gnocchi: Place the potatoes in a 4-quart pot and cover with cold water. Bring to a boil and cook until tender, about 30 minutes. Drain, peel, pass through a ricer onto a counter, and cool to room temperature. Add the flour and knead until smooth, adding a little flour if the dough is sticky. (Test the gnocchi by dropping a few in boiling water before shaping all the dough; add more flour if the gnocchi are too wet, but be careful: the more flour you add, the heavier the gnocchi will be). Roll into 10 logs, cut each log into 1-inch pieces, and toss with flour on a baking sheet. Make the pesto: Heat a 6-inch skillet over a medium flame. Add 2 teaspoons of the olive oil and the pine nuts and cook 5 minutes, or until the pine nuts are golden, stirring often. 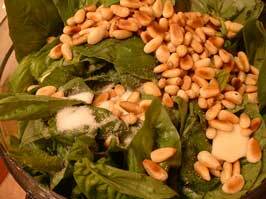 Process the toasted pine nuts to a paste in a food processor with the basil, garlic, and 1/2 teaspoon of the salt. Gradually pour in the remaining cup of olive oil with the motor running; the mixture will emulsify. Bread plumped in milk lends this dish its light texture. 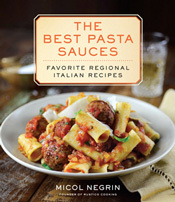 Serve with grilled lamb chops or sautéed veal for a true Ligurian feast. Grease a 14-inch roasting pan with olive oil. Soak the bread in the milk for 5 minutes. Crumble well with your hands to form a paste. Add the eggs and Parmigiano and set aside. Layer the potatoes and zucchini in the pan, seasoning each layer with salt, pepper, garlic, oregano, and olive oil. The arrival of summer means one thing to me above all: the chance to spend time in Liguria, where my family has had a home since I was little and where we take small groups on week-long cooking tours. 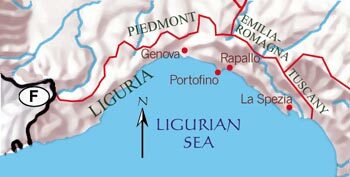 Liguria, a tiny crescent-shaped region nestled between Piedmont and Tuscany, is the birthplace of Pesto alla Genovese, Genova's justly famous basil pesto, and a number of other delicious dishes like wild greens-stuffed pasta in a creamy walnut sauce, delectable cheese-filled focaccia, a stunning seafood and vegetable salad known as Cappon Magro, and plump little jam cookies called Gubeletti (you'll find all these traditional Ligurian recipes in my cookbook). Of all Ligurian specialties, the one that speaks to me most loudly of summer is Pesto alla Genovese: fragrant leaves of basil plucked on the terraced hillsides around Genova are pounded (pestate in Italian, hence the word pesto) in a mortar with sea salt, garlic, pine nuts, grated Pecorino and Parmigiano, and extra-virgin olive oil into a rich, dense paste perfect for saucing fresh or dried pasta and more (see below for serving ideas). Everyone has his or her favorite recipe for Pesto alla Genovese: some cooks omit the pine nuts; some use Pecorino Sardo rather than Pecorino Romano (two firm, aged sheep's milk cheeses that hail from different regions of Italy, the first from Sardinia and the second from Latium or Sardinia); and others fold in a bit of fresh, unsalted butter at the end. 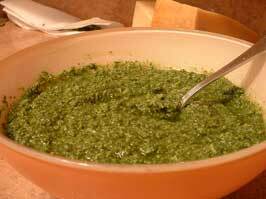 Yet despite the fact that there are many variations on Pesto alla Genovese, there are some basic rules that all good Genovese cooks follow when making pesto. Always use the freshest, most tender, small basil leaves possible. Wash the basil and snip off the stems; the stems are bitter and would ruin the pesto's delicate flavor. Dry the basil thoroughly; clinging water would dilute the pesto's flavor. Don't use too much garlic: the essence of true pesto is the basil, not the garlic. One clove is enough for 2 and 1/2 cups of tightly packed basil leaves (which will yield enough pesto for 4 to 6 servings of pasta). 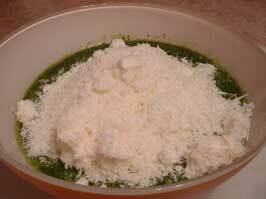 If using a food processor rather than the traditional mortar and pestle, beat the basil, garlic, salt, pine nuts, and olive oil into a paste; turn the mixture out into a bowl and fold in the grated cheese(s) with a fork. If you mix in the cheese(s) using the food processor, the pesto will be too homogenous in texture--it should be a bit chunky when finished, as it would be if you were using a mortar and pestle. Never warm or heat your pesto: this would turn the pesto black and change its lovely, fresh flavor. Place the pesto in a serving bowl and dilute it with a bit of the pasta cooking water before folding in the pasta; the cooking water from the pasta will give the pesto the correct coating consistency. Even if you are on a low-salt diet, add some salt to your pesto: the salt helps to keep the pesto green. To store pesto, place it in a jar and pour a thin layer of extra-virgin olive oil to cover the top; this prevents air from penetrating. You can store pesto in the refrigerator for up to 3 days (although it never tastes as good as when freshly made). If you would like to freeze pesto, do not fold in the grated cheese(s). Place the cheese-less pesto in a jar and pour a thin layer of extra-virgin olive oil to cover the top; this prevents air from penetrating. Freeze up to 1 month, then defrost before use and fold in the grated cheese(s) when you are ready to serve. Fold a dollop of pesto into most vegetable soups--especially minestrone--when you are just about to serve. Spoon a bit of pesto onto toasted bread rounds, top with shaved Ricotta Salata or another firm grating cheese, and serve with drinks at your next gathering. Whisk pesto into a finished risotto (along with the butter and grated Parmigiano in your favorite risotto recipe). Beat equal parts pesto and fresh Ricotta together and spoon into a pastry bag; pipe into scooped out cherry tomatoes or endive spears for a pretty finger food. Toss grilled vegetables (peppers, zucchini, and eggplants are ideal) with extra-virgin olive oil and pesto. Add a bit of pesto the egg salad and serve on focaccia for a memorable panino. Flavor your favorite poultry stuffing with pesto. 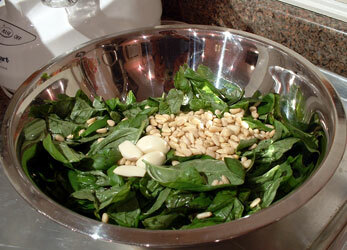 In a food processor, combine the basil leaves, garlic, pine nuts, salt, and olive oil until a thick, creamy paste forms. Do not overprocess or the basil will darken and oxidize and lose its lovely fresh scent. Turn the paste out into a bowl. Using a fork fold the grated Pecorino and Parmigiano into the basil paste in the bowl. The basil pesto is ready. Refrigerate, covered with a thin layer of extra-virgin olive oil, for up to 3 days (although it tastes best when freshly made). 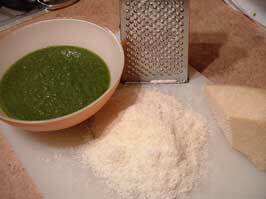 If you would like to freeze pesto, do not fold in the grated cheese(s) in Step 3. Place the cheese-less pesto in a jar and pour a thin layer of extra-virgin olive oil to cover the top; this prevents air from penetrating. Freeze up to 1 month, then defrost before use and fold in the grated cheese(s) when you are ready to serve. 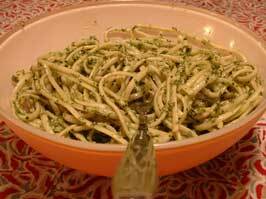 When you are ready to serve, place the pesto in a serving bowl and bring to room temperature. Cook 1 pound of fresh or dried pasta (enough for the amount of pesto the recipe above yields). I suggest potato gnocchi, trenette, linguine, or tagliatelle, or, if you can find them, trofie (small, twirled gnocchi from Liguria). Just before draining the pasta, reserve 1 cup of the pasta cooking water. Fold as much of the reserved pasta cooking water into the pesto as needed to give the pesto a fluid, coating consistency about 1/2 cup should be enough, but more may be needed depending on the sort of pasta you are using). Leek and Smoked Mozzarella "Quiche"
This is a subtle tart I tasted in Liguria, prepared by chef Fausto Oneto at Ristorante U' Giancu in Rapallo. Preheat the oven to 375 degrees. Grease a round 16-inch pizza pan with low sides with olive oil. Make the dough: Combine the flour, salt, milk, and olive oil on a counter. Add a little more milk if the dough is dry, or a little more flour if the dough is sticky. Knead 30 seconds, or until smooth, and wrap in plastic. Let rest at room temperature 1 hour. Meanwhile, make the filling: Melt the butter in a 14-inch sauté pan over a medium flame. 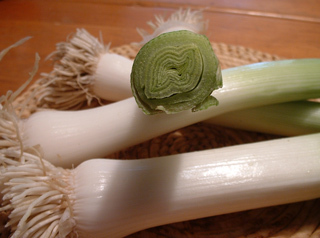 Add the leeks and milk, and cook for 15 minutes, or until the leeks are soft and the milk has evaporated. Add the Parmigiano, smoked Mozzarella, and salt, and cool to room temperature. Adjust the salt if needed. Mussels are plentiful along the rugged Ligurian coastline. Marjoram, a favorite herb in Liguria, lends a lovely aromatic note to this simple shellfish preparation; try tossing the mussels with 1 pound of cooked linguine for a lovely first course. 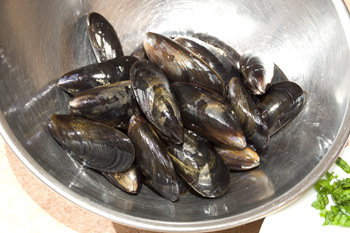 Soak the mussels in cool water to cover with 1 tablespoon of the salt for 30 minutes, then drain and rinse thoroughly a few times. This step is essential for ridding the mussels of any dirt or sediment. Place the garlic, marjoram, parsley, and olive oil in a 4-quart pot. Cook over medium heat for 2 minutes, stirring constantly. Add the wine, mussels, and the remaining 1/2 teaspoon of salt. Fausto Oneto (photo at right) is a generous and talented chef, and the owner of U' Giancu, a legendary restaurant in the hills above Rapallo.This is Fausto's recipe for an easy yet impressive asparagus tart. Preheat the oven to 375 degrees. Grease a round 16-inch pizza pan with low sides. Meanwhile, make the filling: Bring 2 quarts of water to a boil. Add 2 tablespoons of the salt and the asparagus, and cook 8 minutes, or until soft. Drain and shock in ice water. Drain again and blot dry. Chop finely. Heat the olive oil in a 14-inch saute pan over a medium flame. Add the asparagus, 1/2 cup of water, and the remaining 1/4 teaspoon of salt, and saute for 5 minutes, or until the water evaporates. Cool to room temperature, fold in the Parmigiano, and adjust the salt if needed. Roll out the dough until it is very thin on a lightly floured counter (it should measure about 22 inches in diameter) and line the prepared pan with it, letting excess dough hang over the sides of the pan. Spoon in the asparagus filling. Use the overhanging dough to create a pretty border around the tart. 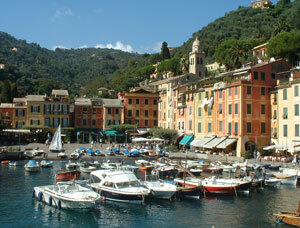 Maria Rosa Costa owns the renowned Ristorante Rosa overlooking the fishing town of Camogli (photo at right). She has a great love for her area and can often be found on her restaurant's splendid terrace, gazing below at the port or at the glorious sunset over the sea. Here is the recipe for her fabulous (and fabulously simple) pasta with Mediterranean herbs. Heat 1 tablespoon of the olive oil in a deep 14-inch saute pan over a high flame. Add the rosemary, sage, and garlic, and saute 30 seconds, or until aromatic. Stir in the tomatoes, season with ½ teaspoon of the salt and the pepper, and cook 10 minutes, adding a little water if needed. Pass through a food mill fitted with a medium disk and return to the pan. Meanwhile, bring 5 quarts of water to a boil. Add the shells and the remaining 2 tablespoons of salt. Cook until al dente. Drain, reserving 1 cup of the pasta cooking water. This refreshing antipasto can be made with any impeccably fresh fish: sea bass, halibut, red snapper, even tuna or salmon will do beautifully. 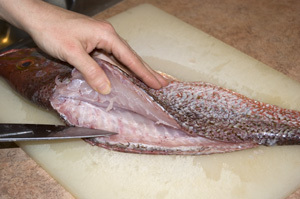 For best results, buy the fish whole and fillet it yourself, as in the photo here. Arrange the fish in a single layer on a large platter. Sprinkle evenly with the lemon juice, vinegar, and salt. Refrigerate for 30 minutes to 2 hours. This simple antipasto calls for fresh anchovies, not salted or oil-preserved ones. Since the anchovies will only be "cooked" by the lemon juice and salt, be sure they are impeccably fresh. 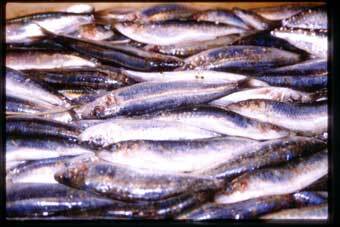 Remove the heads from the anchovies, bone them, gut them, and cut off their fins. Rinse the anchovies under cool running water; thoroughly blot them dry. A few years ago, Roberto (known as Zanna to friends) graciously led a dynamic focaccia demonstration for our cooking tour participants. We watched him knead massive amounts of dough, then shape, dimple and, finally, bake the focaccia to golden perfection. Of course, we all indulged in a hot slice, and many of us felt that his focaccia was the best thing we had ever tasted. Roberto adds the yeast halfway through the kneading process, so the salt doesn't "burn" (or exhaust) the yeast; to do the same, it is essential that you use fresh (cake or compressed) yeast rather than dry yeast, as dry yeast is harder to incorporate into an already formed dough. Mix the flour, 1 tablespoon of the salt, and the sugar in the bowl of an electric mixer. Add 3/4 cup of warm (110°F) water and ¼ cup of the olive oil. Stir with the paddle attachment until the dough starts to gather around it in a cohesive mass. Switch to the dough hook and knead 5 minutes, adding a little more flour if the dough is sticky or a little more water if the dough is dry. Add the yeast, sprinkling it in evenly over the dough, and mix again for another 5 minutes; the yeast should be completely incorporated. The dough should be smooth and supple, and rather soft but not sticky; adjust with a little flour or water as needed. Transfer to an oiled bowl and shape into a ball. Cover with a cloth and let rise at room temperature until doubled, about 1 hour. Transfer the dough to a generously oiled round 18-inch pizza pan and push with your fingers until it extends to the sides of the pan. Let rest 30 minutes, covered. 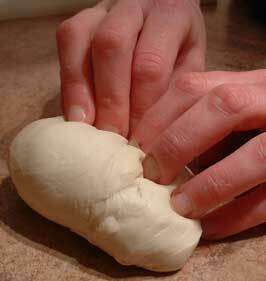 Uncover the dough and dimple it with your fingers, using the pads rather than the nails so you don’t tear the dough. This is the most important step in the focaccia-making process; dimple the dough deeply for best flavor. Let rise at room temperature 30 minutes, covered with a cloth. Meanwhile, preheat the oven to 475°F (preferably with a baking stone in it). Combine the remaining ¼ cup of olive oil and the remaining teaspoon of salt with ¼ cup of room-temperature water in a bowl. Pour over the focaccia. The starting point for this focaccia is an unusual, very thin cheese-filled focaccia from the town of Recco in Liguria. 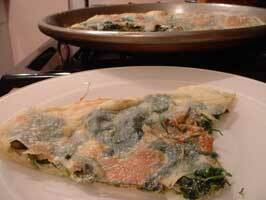 I substituted slices of Marzolino, a milky, somewhat tangy sheep's milk cheese from Tuscany, for the Crescenza or Stracchino cheese typically used in Liguria, and added spinach to make the focaccia richer and more complex in flavor. If Marzolino is hard to find, you can substitute Crescenza or Stracchino, or try any fresh, young (2- or 3-month-old) Pecorino. You can find the steb-by-step version below. Make the dough: Place the flour, 1 teaspoon of the salt, and 2 tablespoons of the olive oil in the bowl of a food processor. With the motor running, add 1/2 cup plus 2 tablespoons of room-temperature water; the dough should come together. Process for 45 seconds, adding water if the dough is dry or flour if the dough is sticky. The dough should be soft and supple, or you will not be able to roll it out until it is nearly transparent later; resist the temptation to add a flour once a ball of dough forms around the blade, and do not overprocess the dough or it may be tough later. Turn the dough out into an oiled bowl, shape into a ball, and wrap. Let rest 30 minutes at room temperature (or refrigerate up to 2 days; return to room temperature before rolling out). Meanwhile, heat 1 teaspoon of the olive oil in a 12-inch skillet over a medium-high flame. Add the spinach, 1/4 teaspoon of the salt, the pepper, and the nutmeg, and sauté for 10 minutes, or until the spinach is wilted, soft, and all the liquid in the skillet has evaporated (it is very important to cook the spinach long enough for the moisture to evaporate, or the spinach will weigh down the dough and make the focaccia heavy and wet). Cool to room temperature. Preheat the oven with a baking stone in it to 550°. Generously oil a round 14-inch pizza pan (use at least 1 tablespoon--don't be skimpy with the oil or the texture of the focaccia won't be right) and line it with 1 piece of dough, allowing excess dough to hang over the sides (there should be at least 1 inch of excess dough on all sides). Scatter the Marzolino slices over the dough, then arrange the spinach here and there over the Marzolino (discard any accumulated juices rather than add them to the focaccia along with the spinach--again, this is to ensure that the focaccia won't cook up wet and heavy as a result of excess moisture). Cover with the other piece of dough. Press the edges to seal and run the rolling pin over the edge of the pan to cut off excess dough, then seal again. (Excess dough can be refrigerated for up to 2 days, covered, and used to make other focaccias; you can also freeze it for up to 1 month and defrost as needed). Make a dough by combining 1 cup of flour, 1 teaspoon of sea salt, and 2 tablespoons of extra-virgin olive oil in a food processor. With the motor running, add 1/2 cup plus 2 tablespoons of room-temperature water; the dough should come together. Process for 45 seconds, adding water if the dough is dry or flour if the dough is sticky. The dough should be soft and supple. Turn the dough out into an oiled bowl, shape into a ball, and wrap. Let rest 30 minutes at room temperature (or refrigerate up to 2 days; return to room temperature before rolling out). You can also make the dough by hand and knead it for 1 or 2 minutes, just until it is soft, smooth, and supple, as shown in the photo at left. Wrap and let rest as above. While the dough rests (a rest helps the gluten to relax, making rolling out easier later), was a large bunch of flat-leaf spinach thoroughly in several changes of cool water. Heat 1 teaspoon of extra-virgin olive oil in a 12-inch skillet over a medium-high flame. Add the spinach, 1/4 teaspoon of sea salt, 1/4 teaspoon of freshly ground black pepper, and 1/8 teaspoon of freshly grated nutmeg. 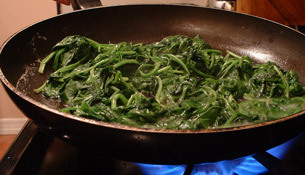 Sauté for 10 minutes, or until the spinach is wilted, soft, and all the liquid in the skillet has evaporated. Cool to room temperature. If Marzolino is hard to find, you can substitute any fresh, young (2- or 3-month-old) Pecorino, preferably from Tuscany. Cut the dough in 2 pieces and roll out both pieces on a lightly floured counter until nearly transparent; if the dough tears, patch with your fingers. Generously oil a round 14-inch pizza pan and line it with 1 piece of dough, allowing excess dough to hang over the sides (there should be at least 1 inch of excess dough on all sides). 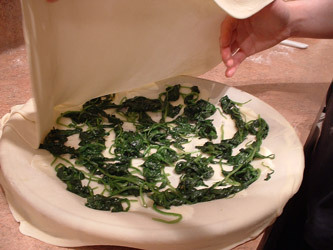 Scatter the Marzolino slices over the dough, then arrange the spinach here and there over the Marzolino (discard any accumulated juices rather than add them to the focaccia along with the spinach to ensure that the focaccia won't cook up wet and heavy as a result of excess moisture). Gently lift the second piece of dough and drape it over the filling in the pan, enclosing the filling entirely and letting excess dough hang over the sides. The dough should be very silky and delicate, yet resistant at the same time; it will stretch easily in your hands and you will be able to see the filling right though it. If the dough tears, simply patch holes with your fingers. Press the top and bottom edges of dough together with your fingers to seal. 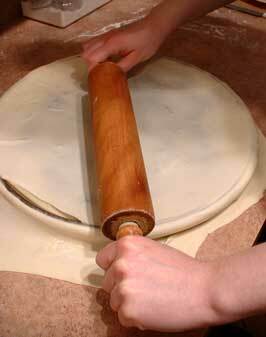 Run the rolling pin over the edge of the pan to cut off excess dough, then seal again with your fingers. Excess dough can be refrigerated for up to 2 days, covered, and used in other focaccias; you can also freeze it for up to 1 month and defrost as needed. Brush the top of the focaccia with the remaining tablespoon of extra-virgin olive oil (I prefer to use my hand, flattening my palm to do the job instead) and sprinkle it with the remaining 1/4 teaspoon of sea salt. Make a small tear in the middle of the dough (this allows air to escape, preventing the dough from doming as a result of accumulated steam as the focaccia bakes). Bake on the baking stone in the preheated 550° oven for 10 minutes, or until the dough is lightly golden and puffed with a few brown spots. You do not want the dough to take on a cracker-like texture: it should still be rather soft. 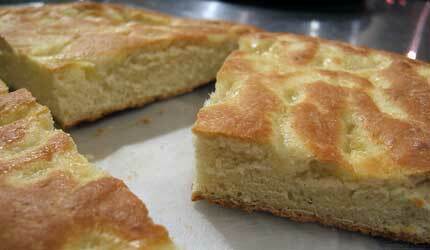 Serve the focaccia immediately upon removing it from the oven for best flavor and texture. Cut it into wedges and enjoy with a crisp glass of your favorite dry white wine. Cinque Terre: the name itself means "Five Lands," but this tiny strip of Ligurian coastline, nestled just north of La Spezia, is really home to Liguria's most magical "Five Towns." The five towns in question are Monterosso, Vernazza, Corniglia, Manarola, and Riomaggiore--each one a treasure, each one unique, and each one worthy of a visit on your next trip to Italy. The Cinque Terre were largely unknown to tourists until recently, accessible only by foot or by boat until trains connected them to other towns in Liguria and roads were built linking them to La Spezia. But despite recent tourism to the Cinque Terre, the towns (most notably sleepy Manarola, home to less than 1,000 inhabitants) still maintain their pristine charm. Perched above the Ligurian Sea on steep, rocky cliffs, the Cinque Terre are an otherworldly combination of wild coastline and rugged mountain, part of UNESCO's World Heritage List. Sky and sea serve as backdrop to a palette of multi-colored houses in classic Ligurian style: homes are painted ochre, burnt sienna, deep rose, blinding turquoise. Cactus pears, rosemary bushes, and citrus thrive in the intense heat of summer and the mild winter months, lining the tortuous paths that connect one town to the next. Whether you decide to take the train or hike, start your visit of the Cinque Terre in Monterosso, the most northerly of the five towns. The beach in Monterosso is sandy and large, and hotel accommodations here are the best. As a result, Monterosso is the most heavily visited of the Cinque Terre. The town boasts the remains of a castle, a medieval tower, twenty or so hotels, and easier car access for those who really want to drive (although I don't suggest it, given how tight and curving the roads are, and how difficult parking is). You are better off reaching Monterosso by train from La Spezia or any other city along the Ligurian coast, or by ferry from Santa Margherita or other Ligurian coast towns. From Monterosso, the walk to Vernazza will take experienced hikers a good two hours; this stretch of the Cinque Terre is the most challenging of all, and is best attempted in the early morning hours. Vernazza has a pretty little harbor; I love to laze on the rocks at the beach, looking up at the old clocktower and painted homes. 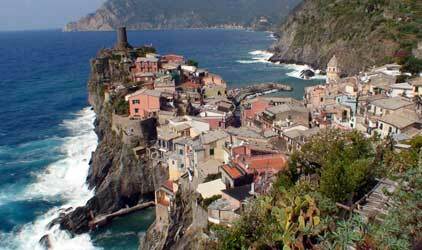 Next is Corniglia, the highest of the five towns and the least overrun by tourists. The hike between Vernazza and Corniglia is quite difficult, with a view of the coastline that seems to stretch forever. Corniglia's beach is rocky and can be reached only from a stairway that loops down from the residential area, unless, of course, you have access to a boat. From Corniglia, the hike to Manarola is brief: an hour or so will get you there. If you like swimming, this is the place to do it, Manarola has a quaint harbor, more like an enclosed rocky cove, where you can swim in the company of tiny crabs no bigger than a fingernail and watch the fishing boats set out for sea. 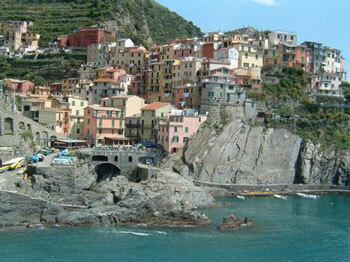 The last town, the one closest to La Spezia, is Riomaggiore. Hiking from Manarola to Riomaggiore is a breeze compared to other stretches in the Cinque Terre: the promenade, known as the Via dell'Amore ("Road of Love") is less than 2 miles long and wide enough for couples to walk hand in hand. (This is unusual in the Cinque Terre, where paths are so narrow that the only way to go is single-file.) Once you've reached Riomaggiore, the sun may just be setting. And if it is, you're in for a treat: locals say that the sunset in Riomaggiore is more spectacular than anywhere else in the Cinque Terre. There is so much good food in Liguria that it is hard to give you a short list of must-trys for your visit to the Cinque Terre. 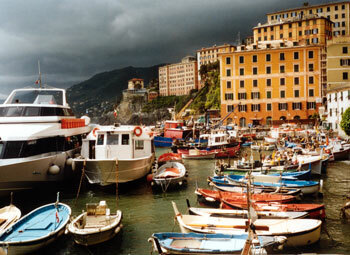 Since all but one of the Cinque Terre are seaside towns (Corniglia, perched highest above the sea, is the exception), the best food tends to be what the fishermen pluck from the waters on any given day: lemony marinated anchovies (see recipe); pasta with clams, mussels, or crab; seafood risotto; grilled fish and the like. 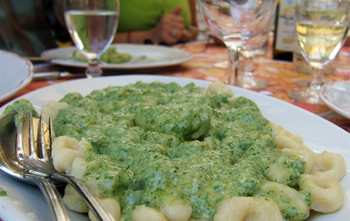 Other than an abundance of fresh, delicious fish and seafood, the Cinque Terre's restaurants, trattorias, and gastronomie (food shops) offer all the Ligurian classics: trenette (linguine-like pasta with one curled edge) or trofie (tiny flour gnocchi) in basil pesto; wild greens-stuffed pansotti (plump ravioli) in creamy walnut sauce; all manner of focaccias; stuffed eggplants, onions, mushrooms, zucchini, and zucchini blossoms; and pandolce, a yeasted sweet cake enriched with raisins and pine nuts. If you are sufficiently trusting and culinarily adventurous, simply ask the waiter or waitress in your eatery of choice to bring you what they think you should try, along with a bottle of the house wine; this, rather than a careful study of menus and wine lists, is often the best way to sample genuine foods and wines in Italy. Despite the Cinque Terre's perilously steep terrain, locals produce some fine olive oil and wine; walking from town to town, you will see olive groves and vineyards terraced on hillsides, close enough to touch from the narrow footpaths. Nearly every dish gets treated to a drizzle of olive oil, and many fish and seafood specialties are doused with white wine for added complexity and aroma. Taggiasca olives are responsible for a light, delicate olive oil which can be purchased in all of the Cinque Terre's food shops; stock up before you return, and you will be rewarded with the taste of Liguria in a bottle. Three of Liguria's most prolific grape varietals (Bosco, Albarola, and Vermentino) are vinified into a delicious dry white wine called Cinqueterre, as well as a rare dessert wine labeled Cinqueterre Sciacchetrà; be sure to taste both while you are in the Cinque Terre. A Cantina de Manaman: Via Fieschi 117, Corniglia, 011/39/0187/821166. Outstanding marinated anchovies and other appetizers. Al Carugio: Via San Pietro 9, Monterosso, 011/39/0187/817453. Traditional fare served in a nautical setting; seafood and fish are especially good. Gambero Rosso: Piazza Marconi 7, Vernazza, 011/39/0187/812265. Sample the stuffed mussels and fresh pastas. Marina Piccola: Via Discovolo 38, Manarola, 011/39/0187/920103. The view of the harbor is stunning, and you might even catch a glimpse of a fishing boat being lowered by pulleys into the blue water; the seafood spaghetti and tagliatelle with crab are a must. Ripa del Sole: Via de Gasperi 4, Riomaggiore, 011/39/0187/920143. Lovely chicche (tiny gnocchi) and other homemade pastas. Enoteca Internazionale: Via Roma 62, Monterosso, 011/39/0187/817278. Wine shop with a great selection of Ligurian wines, as well as local honeys and olive oils. Cooperative Agricoltura Cinque Terre: Località Groppo, Riomaggiore, 011/39/0187/920435. Wine cooperative where you can buy Cinqueterre, Sciacchetrà, and other Ligurian wines. Il Frantoio: Via Goberti 1, Monterosso. 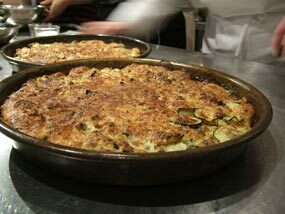 Baked Ligurian goods like farinata (chickpea-flour pancake), cheese-stuffed focaccia, and more. Walter De Battè: Call 011/39/0187/920127 for an appointment. Walter produces the best Sciacchetrà, and will show you around his cellar if you schedule a visit ahead of time. Walter also collaborated with young cheesemonger Guido Porrati of nearby Rapallo to produce a Sciacchetrà-spiked cheese called Trarcantu; be sure to ask Walter for a taste. Hotel Baia: Via Fegina 88, Monterosso, 011/39/0187/817512. Moderately priced, in a good location. Hotel Porta Roca: Monterosso, 011/39/0187/817502. Four-star, quite lovely.